The Iron Age followed both the Stone and Bronze Age and is thought to have commenced about 1000 B.C., although it is widely known that in 300 B.C. the Egyptians were using iron axes and chisels and that the Hittite warriors from Asia Minor (modern day Turkey) were fighting with iron swords and other weapons. Although iron has always been one of the most abundant elements in nature, its usage was slow to evolve due to the fact that the early ironworkers did not understand the necessity to reduce the carbon content of the iron by remelting a second time, and that hammering the ingots would expel the carbon and other impurities to produce the malleable iron we now know. The result was that early iron was similar to cast iron and had a very brittle nature. Let us consider now the birth of wrought iron as a material and of the Blacksmith as a figure of respect. He was, in early days, considered to be a sorcerer with magical powers, using fire and water to convert matter itself. The "homo - faber" was born, the man capable of doing things with his hands, the fabricator. Still concerned with weaponry, but becoming increasingly involved with the domestic items that a modern society, cosmopolitan in the way of ancient Rome, demanded. Even though Plenius (79-23 B.C.) informed us that iron was more expensive than silver, it was in common use in Rome as armor for soldiers as well as door locks, door knockers, hinges, hingebands, and handles. The Romans had started on an industrial basis and in the major towns of the Empire, not only arms, but also fittings and equipment for houses and agriculture were being made. It seems historically possible that there was a co-operative of Blacksmiths in existence in the Roman Republic between the 4th and 1st centuries B.C. The Barbaric invasions which destroyed the Roman Empire brought to light populations that, although uncivilized in the arts, law, road-making and architecture, had extraordinary skills in the working of iron. Beautiful works were produced by the Longobardes (Northern Italians) and for the first time iron was used for ornamental purposes even to the point where precious metals like gold and silver were inlaid as patterns on the surface of iron. We must move to 1000 A.D. before artistically worked iron was used in the construction of churches and monasteries (Winchester Cathedral in England and Notre Dame in Paris being the first). At that time, the monasteries became the schools and motivation for the art of wrought iron and brought the forges close to religious buildings, which led to an extraordinary co-operation between working Monks, (often coming from foreign countries) and the traveling Blacksmiths. He carried his art and knowledge of the nobility's castles to the religious sector of the community. 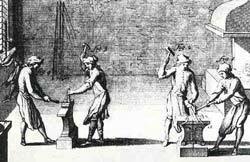 The importance of the Blacksmith in the Middle Ages was well recorded in a famous document when the Blacksmiths of Pisa were accorded privileges and concessions by the Archbishop Dalberto in 1095 and reconfirmed by his successor. To affirm the aura of mystery that still surrounded the Blacksmith in the Middle Ages, it is on record that many towns had written into their bylaws that the enchanting and satanic art should not be performed and that apprentices should not be taught - by penalty of death. However, elsewhere the production of metal was still too scarce. The furnaces which were usually located close to the mines were simple baths of fire clay and called "low fire ovens." In Catalonia, the area around Barcelona, there evolved a type of furnace which was made by forming a hole in the ground in which to melt the iron. They were called "Catalonian Ovens" and from these they were able to form the iron into ingots. Not until the end of the 13th Century in Germany did the vertical "Stuckofen" begin to appear. These were barrel shaped furnaces and used water powered bellows to drive air through them. This gave a greater output of "pig" iron which was then transferred to the low fire for further reduction of carbon content. 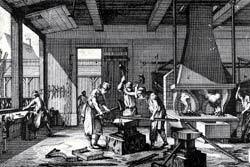 Thus began the real availability of workable iron in quantity. Whilst in the rest of Europe the Gothic style continued, in Tuscany there began a new school of thinkers and artists that took the name of Renaissance (15th - 16th century). One of the main developments of this period was the discovery and use of perspective in painting and architecture that provided for the first time a means to produce rich, well defined proportions. The foremost artists and architects of the time (Jacopo della Quercia) began a co-operation with the Blacksmiths who were then considered on an artistic par. The ironwork for Palazzo Strozzi in Florence was forged around 1490 by the great Nicolo Grosso from designs made by the two famous Renaissance architects, Benedetto Majano and Simone del Pollaiolo. In the 1600's came the era of the Baroque with its emphasis on elaborate ornamentation, and wrought iron, now available with a carbon content of only 0.4% and subsequently very soft and easy to work, was used to produce decorations of great intricacy and grace. Towards the end of the century, adopted from the French "grilles d'honneur" evolved the style of a central gold painted vase from which emitted a profusion of delicately formed leaves and flowers. In the 1700's the designs became even more elaborated with leaves, now being cut from sheets of iron rather than forged from bars and also colored with gold, white and blue to further enhance their splendor. This period represents the pinnacle of wrought iron exotica and artistry and being so distant from the crude iron ore, earned the Blacksmiths the total respect of society. By now, the impression of magic surrounding the art was almost gone, but the conviction remains that the Blacksmith is a Master Craftsman and Artist whose skills are greatly coveted. jean Tijou, a French Master Blacksmith, operated in England between the end of the 1600's and the beginning of the 1700's and was knighted by the sovereign William III for his services in the creation of Hampton Court Palace. During the Neoclassicism period (late 18th and early 19th centuries) the requirement for the art of the Blacksmith began to decline. Buildings designed in the classical style with straight line simplicity were in opposition to the art. For the first time, the blacksmith came under the control of the designer, following the drawings without question and his powers to create original concepts as an artist were stripped from him. The increasing use of cast iron to produce castings further aided the decline of the art and it seemed impossible to halt the decay. Only towards the end of the last century, under the influence of the Romantic movement headed by Ruskin and Morris in England, was it believed that art could re-born by the re-birth of craftsmanship. In the factories of Boulanger in France, the architect Violet - le Duc revived the art of wrought iron, giving back dignity and life to an art form that had almost died. Commencing towards the end of the last century and continuing until the 1920's, the Art Nouveau or Floral (Liberty) style rediscovered the line of nature for enclosing spaces in architecture and providing once again opportunities for metal art. This time, using the additional technologies of steam power, gas welding, etc. architecturally well defined areas for gates balustrades, staircases and screens were abundant with flowers, fruits, fishes and birds. In our time, after about 20 years in limbo coinciding with the presence of the not yet dead Modern movement or Rationalism, the Blacksmiths' art is rapidly reclaiming all of its dignity. Disregard any spurious claims or discussions concerning whether it is legitimate or not to use the modern techniques of electric welding, electric furnaces, presses, etc. and look instead at the re-birth of wrought iron that we are helping to create, to satisfy a demand from the designer and the end user. Personally, we are not at all surprised at this demand. The guarantee of ornamental security given by the most useful and abundant metal on Earth for over 2000 years does not seem to be any less important to modern man than it was to his forefathers. It seems instead to be a part of his existence. Yes! It could well be that there is something magical about wrought iron that will keep it in its place, close to man, for the next thousand years.